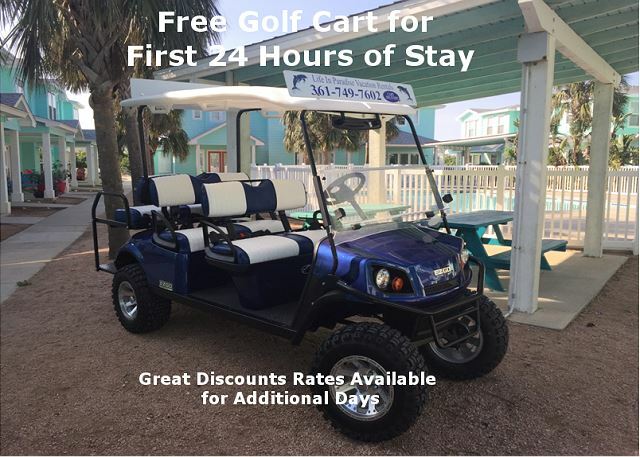 First night you get a free golf cart! Living Space, Dining area and Kitchen all open space concept. Dining Table has seating for 8 and Bar Stools as well. Dining Area, Living and Kitchen all open space concept. King Size Bed, TV., Private Bathroom and Balcony. Located Upstairs. 2nd King Master Suite, TV., located downstairs. Bunk bed-1, 1 Twin over 1 Twin; Bunk bed-2, 1-Twin over 1 Full. New 3 Bedroom, 2 1/2 Bath, 1 Car Garage, 2 King Suites, Bunk bed-1, 1 Twin over 1 Twin; Bunk bed-2 1 Twin over 1 Full. Sleeps 9. Community Shared Swimming Pool, Unit has BBQ-Pit Plus Pool area has BBQ- Pits too. Picnic tables at Pool area. New 3 Bedroom, 2 1/2 Bath, 1 Car Garage, 2 King Suites, Bunk bed-1, 1 Twin over 1 Twin; Bunk bed-2 1 Twin over 1 Full. Sleeps 9. Community Shared Swimming Pool, Unit has BBQ-Pit Plus Pool area has BBQ- Pits too. Picnic tables at Pool area. New 3 Bedroom, 2 1/2 Bath, 1 Car Garage, 2 King Suites, Bunk bed-1, 1 Twin over 1 Twin; Bunk bed-2 1 Twin over 1 Full. Sleeps 9. Community Shared Swimming Pool, Unit has BBQ-Pit Plus Pool area has BBQ- Pits too. Picnic tables at Pool area. Located on 11th Street. Seating outside upstairs Master Bedroom, Sit out and enjoy your cup of coffee. BBQ-Pit out back of Townhome. This small balcony is just out the dining room area. Community Shared Swimming Pool, Enjoy the waterfall at the pool, has lots of lawn chairs, Palapa shades with tables and chairs, BBQ-Pits and picnic tables. Community Shared Swimming Pool, Enjoy the waterfall and slide at the pool, has lots of lawn chairs, Palapa shades with tables and chairs, BBQ-Pits and picnic tables. Community Shared Swimming Pool, Enjoy the waterfall and slide at the pool, has lots of lawn chairs, Palapa shades with tables and chairs, BBQ-Pits and picnic tables. Fully equipped Kitchen with all your cooking amenities. Kitchen, Dining area and Living room all open space concept. Fully equipped Kitchen with all your cooking amenities. Kitchen, Dining area and Living room all open space concept. King Size Bed, TV., Private Bathroom and Balcony. Located Upstairs. Fully equipped Kitchen with all your cooking amenities. Kitchen, Dining area and Living room all open space concept. Dining Table has seating for 8 and Bar Stools as well. Dining Area, Living and Kitchen all open space concept. Living Space, Dining area and Kitchen all open space concept. Living room Sectional Sofa, TV., Dining Area and Kitchen all open space concept located upstairs. Living room Sectional Sofa, TV., Dining Area and Kitchen all open space concept. Living Space, Dining area and Kitchen all open space concept. Fully equipped Kitchen with all your cooking amenities. Kitchen, Dining area and Living room all open space concept. Fully equipped Kitchen with all your cooking amenities. Kitchen, Dining area and Living room all open space concept. Living room upstairs. Half Bath Located Upstairs. Half Bath Located Upstairs. King Size Bed, TV., Private Bathroom and Balcony. Located Upstairs. King Size Bed, TV., Private Bathroom and Balcony. Located Upstairs. Private bathroom with Master bedroom shower no tub. Located upstairs. Private bathroom with Master bedroom shower no tub. Located upstairs. Private bathroom with Master bedroom shower no tub. Located upstairs. 2nd King Master Suite, TV., located downstairs. 2nd King Master Suite, TV., located downstairs. 2nd King Master Suite, TV., located downstairs. 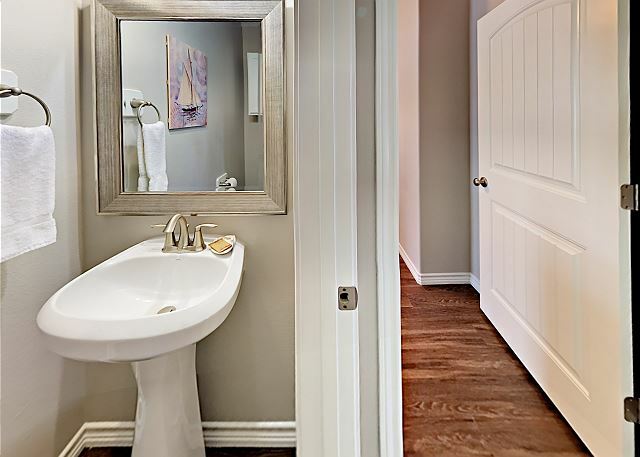 Full bathroom located in downstairs hallway with both shower and tub combination. 1st Bunk bed has 2 Twin Beds; 2nd Bunk bed has 1 Top Twin and 1 Bottom Full Size Futon. Washer and Dryer located in downstairs Hallway. Stairwell New 3 Bedroom, 2 1/2 Bath, 1 Car Garage, 2 King Suites, Bunk bed-1, 1 Twin over 1 Twin; Bunk bed-2 1 Twin over 1 Full. Sleeps 9. Community Shared Swimming Pool, Unit has BBQ-Pit Plus Pool area has BBQ- Pits too. Picnic tables at Pool area. Aqua Bella at Beachside Condos is a family friendly three-bedroom condo conveniently located on 11th street. 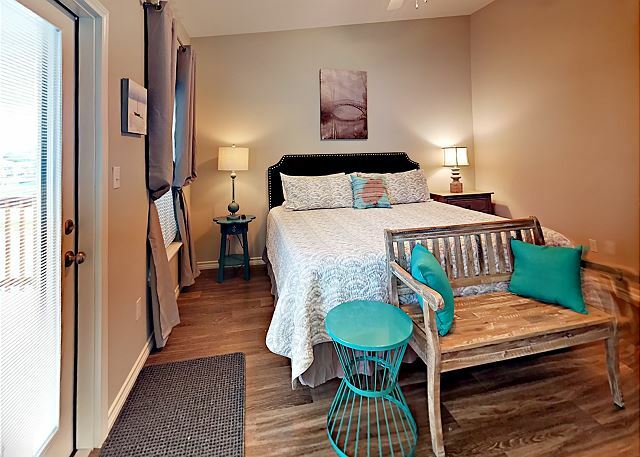 Aqua Bella sits near the HEATED salt water pool, and is beautifully decorated with beach-inspired decor and beautiful hardwood floors throughout. 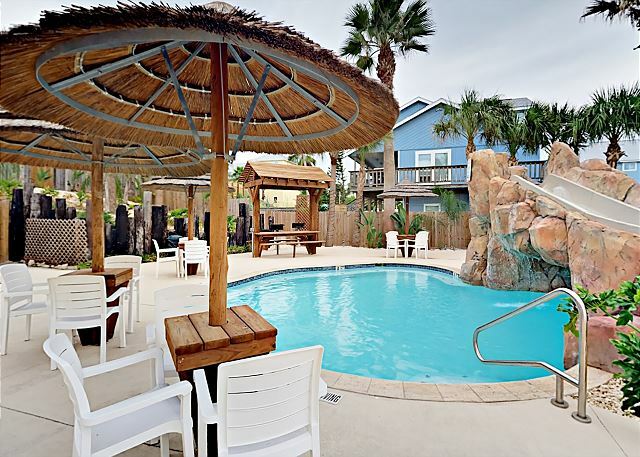 If you are looking for a great location central to all that Port Aransas has to offer, look no further! Park your car in your dedicated parking space and leave it for the duration of your stay. NO BOATS OR TRAILERS. An 8-minute walk gets you to the acclaimed Gulf Coast beach, shopping, restaurants, and activities. After sightseeing, return to your Port A home and relax on your outdoor patio. Outdoor chairs and gas grill are there for you to enjoy. 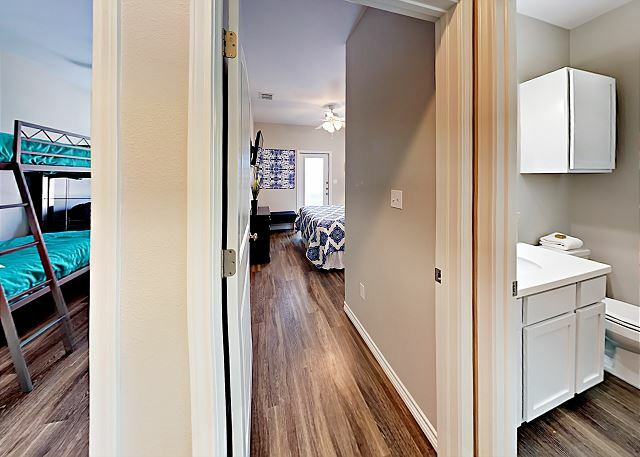 Open up the doors to your living room where you will find new and comfy furniture, a flat screen HD TV, cable and wifi. The dining room seats 8 and the spacious bar seats 4. The dining area has a pass through to the fully stocked galley kitchen. 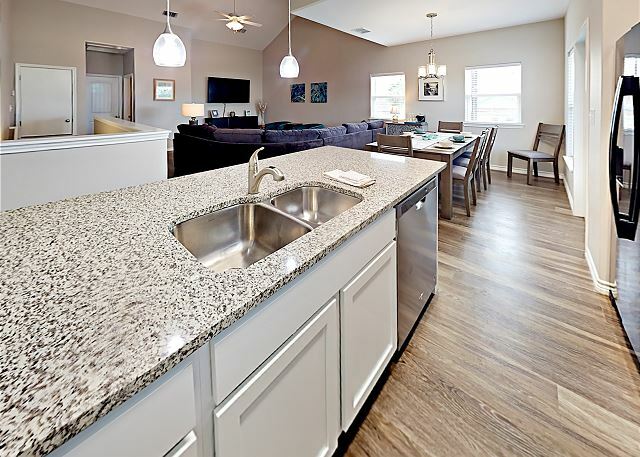 Granite counter tops and stainless steel appliances will make the family cook happy! The master bedroom offers a plush king size bed, flat screen TV and private en-suite bath with a full sized shower. 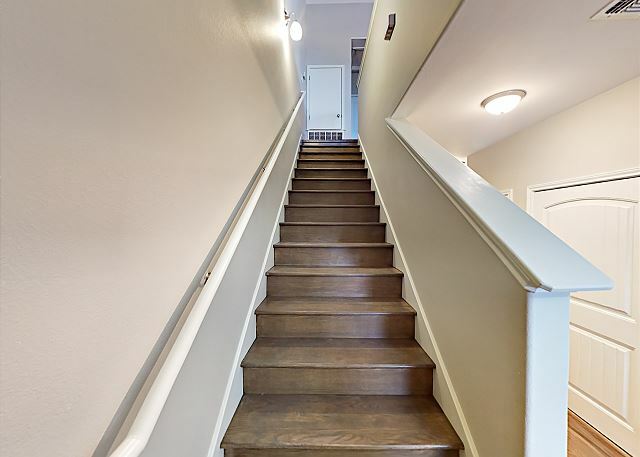 The additional two bedrooms are located on the first floor. 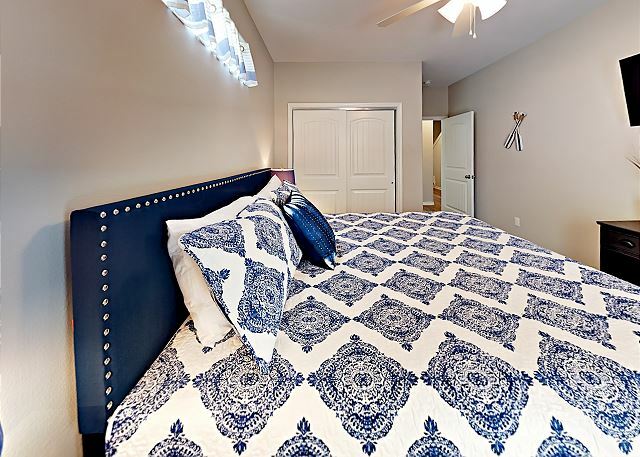 One guest bedroom offers a king bed, flat screen TV and private patio entry. The bunk room offers a twin over full bunk bed, a twin over twin bunk bed and a flat screen TV. 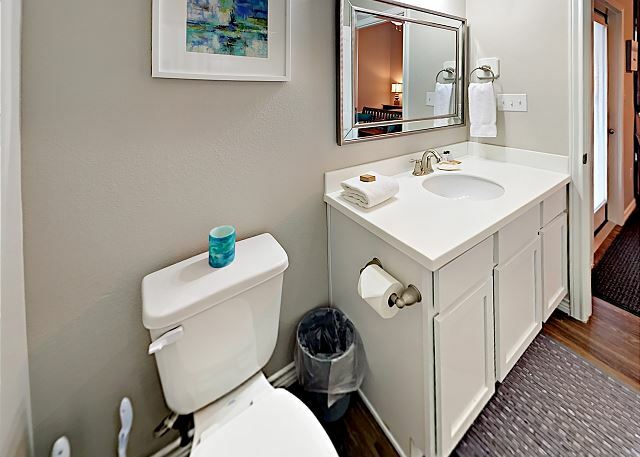 The shared bathroom has Corian counter tops and a bathtub. 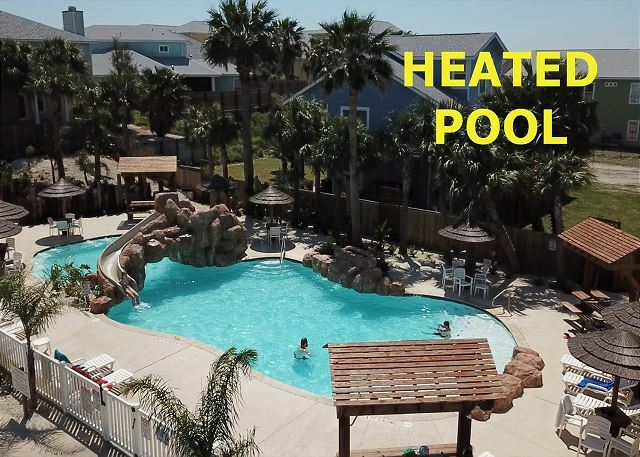 Enjoy the AMAZING Heated Pool with Waterslide and Palpas throughout. 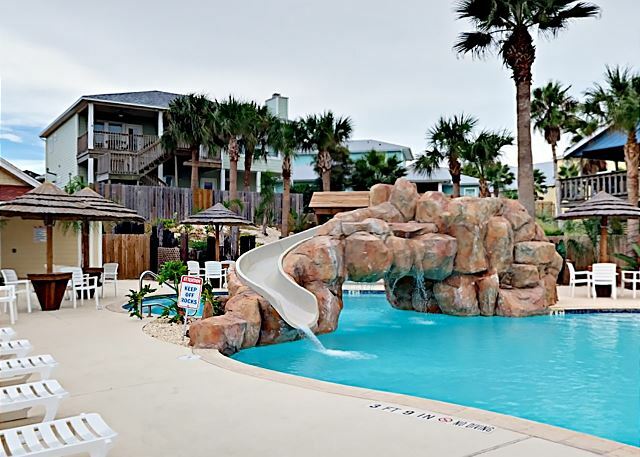 Beachside is located just blocks from everything in Port A! What are you waiting for? Book and Stay at Beachside!